The cruise ticket has to be collected at PARISCityVISION any time during the opening hours. The time indicated (11pm) is the time of the Moulin Rouge show. This pass lets you see the show at Moulin Rouge and also take a cruise on the Seine river. Enjoy the fabulous show at Moulin Rouge whenever you choose. The cabaret is near Montmartre in a very lively neighborhood. Come see the world-class Doriss Girls. You'll be amazed at the different scenes played before your eyes for nearly two hours. Among them are the famous French Cancan—a typical Parisian cabaret dance—and sensational numbers like the giant aquarium and other jaw-dropping dances. During the show, you will be served a ½ bottle of Champagne. 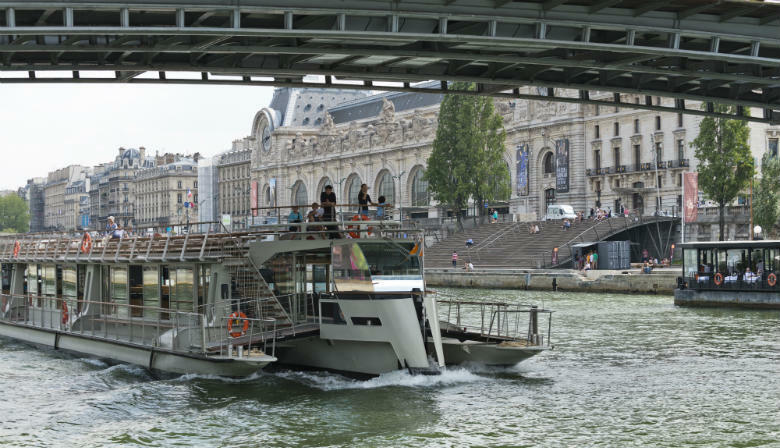 The cruise ticket lets you climb aboard a Seine river ride whenever you choose. Tours depart from Quai de la Bourdonnais, across from the Eiffel Tower. Hop on board a Bateaux Parisiens boat and discover Paris during a one-hour Seine river cruise. An audio guide is provided along with individual earphones to teach you about the history of Paris monuments bordering the Seine, such as the Louvre, Musée d'Orsay, Conciergerie, Eiffel Tower and Notre-Dame. You will receive a reservation confirmation by e-mail, as well as a voucher. The time indicated (11 pm) is the time of the Moulin Rouge show. You can redeem your voucher directly at the Moulin Rouge. Regarding the cruise ticket, it is valid at any time of the day following the opening hours of the site. Outstanding service and value. Moulin Rouge for 4 with champagne and a tour via the Sienne is not to be missed. This organization was easy to do business with, very helpful and reliable. I highly recommend!